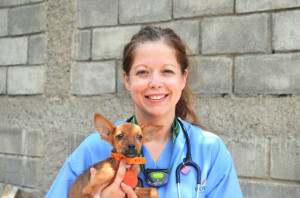 A: I have over 10 year`s experience as a Registered Veterinary Technician at a Specialty Hospital in North Carolina. Although I love Anesthesia and Critical Care the best, I really like to dabble a little bit with everything from large animal to avian/exotics and zoo animals. A: My husband Chris lives and works in the Middle East, which means that I travel a lot. We also have Bailey, the Amazing Dalmatian. A: I like the high expectations that the trip leaders require with medical care. Although at times we work in unusual circumstances, patient care is always a priority. A: I had a wonderful experience last summer on the Pacific Partnership Mission and was looking for another experience. I have been down at the Latin America Training Center in Nicaragua for the last month as an IVM Instructor. I find it very fulfilling to see students come through the training program and develop fantastic skills and self-confidence. I feel good that I am a part of that. A: Quickly doing a blood transfusion while both dogs were on the OR table. Also, the feeling of giving back to the local community by helping to control their animal population.